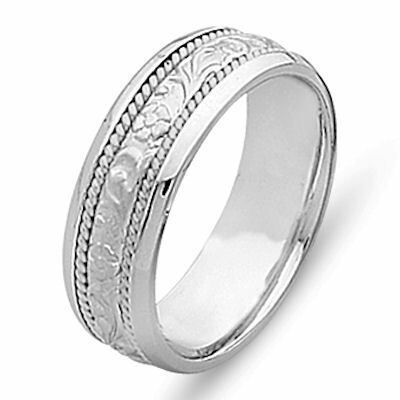 Platinum hand carved, 6.0 mm wide comfort fit Celtic wedding band. The ring has hand carved platinum designs and two twisted ropes made in platinum. The center is matte finish and the rest is polished. Different finishes may be selected or specified. Great service!! the band I ordered was better than pictured!! Absolutely gorgeous I would definitely order from here in the future. My mailing address was different from my billing address and I received a phone call shortly after placing my order to double check that It was not a mistake. The ring arrived in a padded envelope inside another padded envelope well protected and discrete labeling so couldnt tell that valuables were being shipped. The ring/engraving was done in 24-48 hrs and shipped arriving to Alaska within 5-7 days! Amazing! Overall would give this company a 10/10!! !